A short time ago, I posted on poverty and the growing world population (7 billion and counting), and about the challenge of deciding how to respond (The cost of addressing world poverty). Let’s start with something small which most of us can do this week, or this year. About 80% of the world’s cocoa is grown in West Africa, with Cote d’Ivoire accounting for about half of this. There can be no doubt that some of the chocolate we all eat was grown on plantations which exploit and abuse slave children. The cocoa and chocolate industries and the governments of Ghana and Cote d’Ivoire have set up certification procedures and protocols to reduce slave labour, but progress so far has been slow. 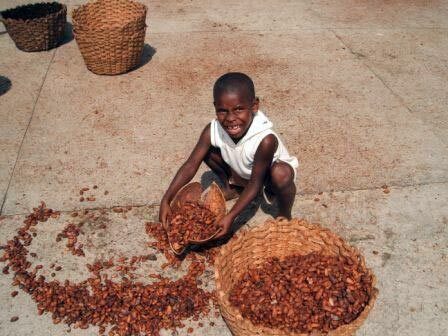 Several different certification processes (Fair Trade, Rainforest Alliance, UTZ have been set up and a number of small manufacturers offer chocolates certified as child labour free. However these brands account for less than 1% of all chocolates bought, and sometimes things can still go wrong. Larger manufacturers have responded slowly. In Australia, major manufacturers Cadbury, Nestle and Mars each have one certified product among their extensive ranges. We, the chocolate buying public in the rich western world, can make a difference. We can make a shift in our purchases. This will involve some sacrifice, as certified chocolates are often more expensive and have a much smaller range. It is not realistic to only purchase certified chocolate, but we can go a long way towards that. We can write to chocolate manufacturers encouraging them to use certified child labour free cocoa. If we are willing to change our buying habits, we can explain this to the manufacturers. I have begun, falteringly, to move in this direction. I am beginning to amend my chocolate buying habits and will try to find more Fair Trade alternatives. And I have written to the manufacturers of the two brands of chocolates I eat most. I wrote to Cadbury, complimenting them on making one of their range Fair Trade, but suggesting chocolate eaters with a conscience might like greater choice. And I wrote to local confectioner, Darrell Lea, who have no Fair Trade products, asking them to consider taking this step. I’ll report back what they say. « Does religion cause wars?